The Glencoe Concert Association Series Board of Directors draws folks from all walks of life and several communities. Pictured, front row from left, are Tom Urban, Kathy Urban, Jan Petrick, Leona Donnay, Nita Endersen, Janice Jacques and Darlene Dammann; and, back row, Greg Risnes of Allied Concert Series, Jerilyn Shearer, Ardeen Graupmann, Louie Graupmann, Eldean Enderson, Dennis Dittmer, Don Petrick, Dennis Davis, Chris Davis and Charlotte Dittmer. The Glencoe Concert Association Series has been around since the mid-1970s, bringing quality musicians to the Glencoe area. But many who enjoy the benefits of that association’s efforts may not be aware of the behind-the-scenes work of the group that supports it, its board of directors. 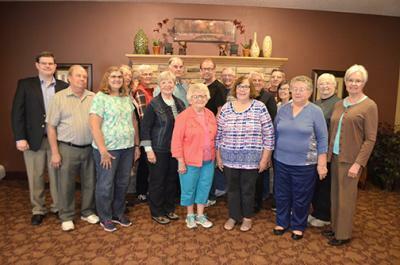 The board numbers 17 members, 16 of whom (one was vacationing in Spain) gathered Wednesday, Sept. 27, at Grand Meadows to begin plans for its 2018-19 season. Board Member Don Petrick said the association started in about 1972 or ’73, when a small group approached the Chamber of Commerce about hosting a series of performing artist concerts to bring quality musicians to the Glencoe area. As the idea took on life, more people joined the endeavor. “We had people from all walks of life,” said Don Petrick. The same holds true today, over 40 years later. The board consists not only of Glencoe residents, but from Biscay and Plato as well. Although the board membership seems large, said President Jan Petrick, it is a good working group. “Whatever you need, you just ask and it gets done,” she said. On Wednesday, the group was working with Allied Concert Services to set up its 2018-19 season. Greg Risnes of Allied Concert Services said it works with about 140 similar organizations throughout the U.S., as well as about 30 performing artists and groups, to bring “good quality music at a fair price” to smaller communities, those which normally could not afford to do so. Allied Concert Services also works with a similar group in Hutchinson, and Glencoe and Hutchinson have created a reciprocating agreement that allows members of each to attend concerts at the other’s venues under their individual memberships. Each association plans three concerts a year, with different artists at each. That gives the potential for a member to attend up to six concerts a year. The Glencoe Concert Association Series uses memberships and sponsorships as its main source of funding, although individual admissions are sold at the door for concerts. Jan Petrick said that the memberships and sponsorships ensure revenue for planning purposes. The Glencoe association currently has 144 adult memberships and five family memberships. The concerts are well attended, not only by members and local residents, but by others from as far away as St. Cloud, Minneapolis, Minnesota Lake and Eden Prairie. The group expressed gratitude for the organizations that are willing to share the facilities as venues for the concerts, including the Glencoe City Center, and Glencoe-Silver Lake Schools. Petrick said she is especially grateful for the board. “They are here because they really love music, and they want to share it with others,” said Petrick. For more about the organization, see the Oct. 4 print edition of The Chronicle.